Few tropical trees develop flowers with a pure blue tone. Often a blended hue of violet, indigo or blue creates a bluish flower. Grow these trees in the garden where frosts never occur, typically in USDA Hardiness Zones 9 and warmer. More cobalt to turquoise blue colors form in the fruits of some tropical trees, although their flowers are not blue whatsoever. 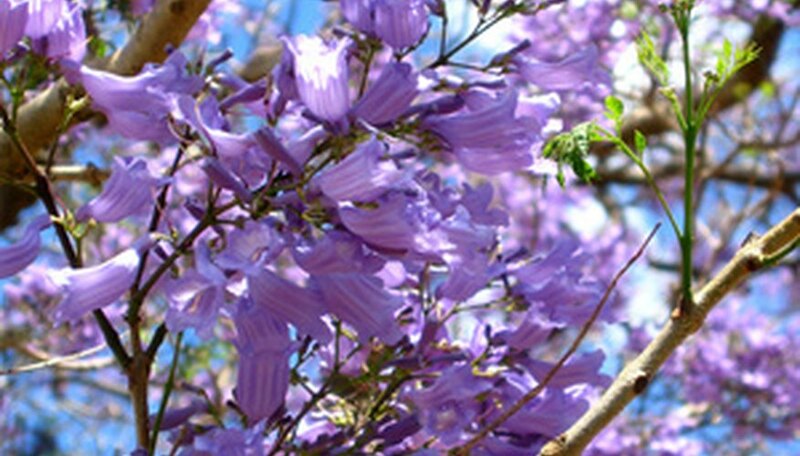 Four species of jacaranda bear trumpet-shaped flowers in clusters atop their feathery foliage. Their flower color centers around blue-violet, but in different light intensities varies from lavender-blue to sky blue. Jacaranda mimosifolia blooms in winter and spring, Jacaranda cuspidifolia blooms intermittently across spring and summer. Green ebony (Jacaranda caerulea) flowers in spring and tolerates coastal garden soils. Also called green ebony, the Cuban jacaranda (Jacaranda arborea) blooms in spring with blue-violet flowers with white throats. Native to Mexico, the Mayan lilac (Lonchocarpus longistylus) grows upward of 50 to 60 feet in height and produces clusters of wisteria-like flowers in spring and summer on its droopy branches. The flowers range in color from blue-violet to lavender to nearly white. Usually regarded as shrubs since they grow slowly and mature to a height of 10 to 30 feet, lignum-vitae species produces deep-blue violet to powdery blue flowers in late winter and spring and sporadically across the summer. Choose from either the common lignum-vitae (Guaiacum officinale) or the holywood or palo santo (Guaiacum sanctum). Two groups of tropical plants produce flowers that change from purple or blue-violet to white over time. As the blossoms fade over two to three days, true blue tones may result in the transition from purple to white. Yesterday-today-tomorrow (Brunfelsia grandiflora) and the Paraguay jessamine (Brunfelsia australis) produces springtime blossoms that open purple to dark blue-violet and become white by the third day. Brazilian potato tree (Solanum wrightii) similarly open flowers first a royal purple and then pass through shades of blue-violet as they age to white.